In the midst of the majesty of Durham cathedral, tucked away in the sanctity and silence of the Galilee chapel, next to the tomb of the historian of the English church in Durham, the Venerable Bede, stands a figure. Next to Bede, one might have thought of the need for grandeur next one of such ecclesiastical greatness, but no. Controversially stands the diminutive stature, the slight frame, the delicate features not quite grown into yet of a teenage girl. There is a gracefulness and yet awkwardness about her as she stands almost coyly next to the English saint. This is Mary - the shy, unassuming girl edging with some difficulty into womanhood whom you still see coming out of the newsagent's at 4.30pm with her school uniform untucked, who spends hours with her friends trying out the cheap make-up she bought in the bathroom mirror. That said, by Jewish standards, she will have been a woman socially, legally, and religiously. In her story, in the last hours of Jesus’ life he is recorded as sharing dinner at Simon the Pharisee’s house. The meal would have been in the very fashionable Greco-Roman style, the guests reclining at the table. In the shadows of the surrounding colonnade, it was permissible for the poor to gather, waiting for the occasional morsel or the chance to ask some favour of the rich. From the shadows she comes and silently washes his feet with tears of repentance and dries them with her hair and then anoints them with ointment. One of the beautiful ambiguities of the gospel accounts that we have and the strength of Christian tradition and imagination is that Mary Magdelene has been also been associated with the unnamed woman who anoints Jesus’ feet with perfume, who John here names for us here as Mary the sister of Martha and Lazarus. The Gospels tell us that Jesus had healed Mary Magdelene - possibly of what we today might call epilepsy. Another separate noble Christian tradition also makes Mary a tearful, repentant prostitute. The sexuality and passion of that act of washing and anointing perhaps alludes to her profession. She is fearless to the breech of etiquette, almost brazen, yet something has freed her. Whoever these ‘Mary’s’ are, whether they are one and the same or not, I would like to introduce them to you. None of these Mary’s would not have been very old by our standards - teenagers. 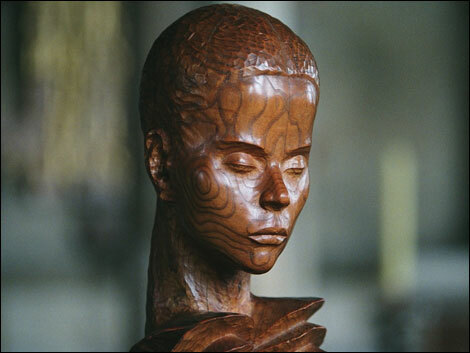 Donatello carved her image in wood in the fourteenth century. She has a gaunt face, bearing a slightly distraut expression; her mouth is drawn as if something inside is tearing at her. She looks strong and wiry, the muscles visible in her arms. She stands with her legs apart, one knee very slightly bent. Her arms and hands meet just below her throat, the fingers not quite touching. It is almost, but not quite an attitude of prayer - she seems to be beseeching someone for something. Her hair is matted and long, reaching below her knees, a kind of wild unkempt garment. The whole impression is of one immensely and passionately alive but living on the edge of nerves, the edge of nutrition, the edge of sanity, the edge of society. Mary is worthy of a sermon all on her own in Holy Week because, the woman we hear about later this week at the crucifixion or in the garden meeting the risen Jesus when his other followers cower, is completely different. Something has happened, as in those places of horror and elation we encounter a woman transformed, no transfigured, healed, at peace with herself, with God, and with others. Whoever Mary is, whichever Mary she is, Christ does not speak to her, but accepts her gift of love. In those seconds there is an unspoken exchange of love which in an instant allows her to approach and to see with God’s eyes. In that eternal moment she knows somehow that Jesus is not just a teacher or healer, or prophet, but all of those and more. She knows that there is something more yet to come, something that she cannot name or identify, something that she yearns and aches for. Whether we see her anointing in terms repentance for sin or thanksgiving for healing or raising a dead brother doesn’t really matter. What matters is that she has seen Jesus for who he is, she has lifted the corner of the curtain and has been blinded by the glory of God. Mary beckons this week to follow her if we dare, from the shadows of the colonnade. She urgently wants us to experience the same yearning she feels in the presence of Christ and to allow that eternal encounter to fill us with his reconciling, healing peace. The thing is, we will only be transfigured as she was, if we allow the story of Christ from cradle to grave and beyond to come off the page of the scriptures to breath, teach, heal and live. All those Mary’s had an intense and passionate faith in a Jesus who raised people from the dead, who healed incurable disease, who forgave the unforgivable. If our Jesus remains the text of God’s story then the agony of death, disease, social unacceptability, remain resignedly part of the way life is and all that these Mary’s found in Jesus stay as unobtainable ideals. If our Jesus is allowed to be the Word in God’s story then through the agony of the cross and the elation of the garden tomb we will find ourselves, like all those Mary’s, knowing the reconciling peace of God which if it is is his will, will prevent death, disease or the pain that life is sometimes full of, but that will always enable us to lift the corner of the curtain of life and allow us to be blinded by the glory of God. Amen.